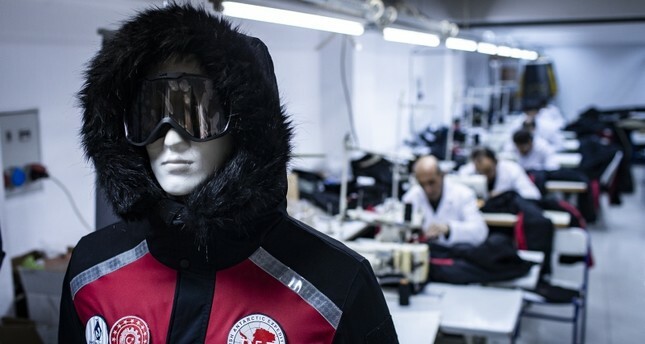 A team of Turkish scientists are developing clothing especially designed to withstand sub-zero weather conditions in Antarctica, the world's coldest continent. According to Caner Filiz, an instructor at Turkey's Gendarmerie and Coast Guard Academy, the project is being carried out in coordination with Turkey's Coast Guard Command and with contributions from the Turkish Mountaineering Federation. "Logistics are the main problem in Antarctica," Filiz told Anadolu Agency. "It's very important that those working there are able to protect themselves from the elements." Turkish textile firms, he added, were providing raw materials for the initiative, dubbed the "Indigenous Polar Clothes" project. "We're developing clothes and protective materials -- including masks, underwear, gloves, shoes and berets -- that have high waterproofing and respiration standards," Yalçın Yıldırım, the head of Özyiğit Textile, which produces clothes for the military and state institutions, told Anadolu Agency. "We often produce clothing for extremely cold climates, but this project was unique," Yıldırım said. "Within a short period of time, we managed to create clothes based on our experiences." The project, which is also being supported by the Turkish Presidency, the Industry and Technology Ministry and Istanbul Technical University's Polar Research Center, along with other Turkish universities, will also involve a battery of scientific studies that will be conducted over the next 30 days. The Polar Research Center was established in Antarctica in 2015 with the aim of conducting research and raising Turkey's profile among the international scientific community. In April 2016, the first-ever Turkish team of researchers -- including medics, botanists, geologists and oceanographers from seven universities -- traveled to Antarctica to study the impact of climate change. Turkey, which currently holds "observer" status among treaty signatories, hopes to eventually see this raised to "consultative" status. The lowest temperature ever seen in Antarctica, -89 degrees Celsius (-128 Fahrenheit), was recorded in 1983. During summer months, however, temperatures on the continent can reach as high as -15 degrees Celsius (5 Fahrenheit).